Sound fitted DCC controlled locomotives are being more and more popular, effective and cheaper, especially since the introduction of cheaper sounds chips such as the Hornby TTS range of sound fitted decoders. However whilst the sounds of the locomotive themselves are achieved with a few add on sounds such as doors closing and guards whistles, what such sound fitted locomotives emphasise is that the ambient sounds of people, machinery, birds, water or waves (where appropriate) and sounds of the rolling stock, buffering wagons and flange squealing that is missing. For Canute Road Quay I wanted to provide an overall immersive experience for the viewer at an exhibition by providing a mix of sounds to include not just steam locomotive sounds but those of the rolling stock and other typical background sounds that you would hear at a working quayside. I also wanted it to be reasonable subtle. Hornby have recently partially addressed these requirements with their R6925TTS sound fitted vent van this has 29 separate sounds that covers some of the above ambient sounds including steam, locos, wagons being shunted, flange squeal, birds etc. However, this would not be suitable for use on Canute Road Quay for a number of reasons; firstly it requires DCC control requiring each sound to be activated, up to three at any time, using function buttons rather than just playing on a loop, , secondly it does not feature all the sounds I require such as Herring Gulls etc. and finally would really require the wagon, which is not quote the correct period for my usual 1946 to 1949 period to be located on the layout all the time which would hamper operation a bit. I therefore having spent some time looking around for suitable sound clips to make my own file, came across a friendly and efficient small supplier called BigTrainSound.co.uk The guys here can supply a number of off the shelf sound files ranging from platform announcements to urban sounds from different eras and weather conditions including thunderstorms. Another service they provide is to produce bespoke soundscapes of either 30 or 50 minute duration tailored to meet a clients needs. Paul at BigTrainSound.co.uk quickly gained an understanding of my requirements from looking at pictures of Canute Road Quay, reading this blog and from my own suggested required sounds. Within a couple of days I had a schedule of proposed sounds and timings for approval followed by a provisional sound file. By the end of the week I had the agreed completed 50 minute soundscape file, very efficient service! The ambient soundscape file is built upon a base layer of breezes and lapping water sounds then with multiple other sounds layered over it at different times including the following: Herring Gulls, steam locomotives shunting at various times (actual sounds recorded of shunting at Bristol and Goole docks), wagon wheel squeals, ships hooters, distant fog horn, truck arriving and departing, conversations, unloading wagons, dogs barking etc. Last month saw the first exhibition with the sounds being played via a Bluetooth speaker simply clamped underneath the layout. I was certainly very pleased with the overall effect and even though the locomotive / shunting sounds are not synced with the actual movements during operation, it became a bit of a fun challenge to try and get the movements to coincide, which we managed quite often so much so viewers often commented that they thought the locos were DCC Sound fitted! The video clips above give a brief idea of some of the sounds. I can totally recommended the great service by Paul and his team at BigTrainSound.co.uk as a very satisfied client. If you want to see Canute Road Quay and experience the ambient sound effect, Canute Road Quay is making an appearance this coming Saturday 23rd February at the excellent little RisEx exhibition organised by the Princes Risborough and District Model Railway Club. If you planning to pop along to RisEx, please make sure you to say hello. PS. if you are wondering about the title its a sneaky reference to one of my favourite bands, their 17th album in fact.. The next couple of exhibition appearance of Canute Road Quay are drawing near, as always I always look forward to exhibiting my little train sets and enjoy catching up with friends and making news ones alike. An ex LSWR Adams B4 0-4-0T shunts the loco coal to the small sub shed at Canute Road Quay. The B4 is a McGowens white metal kit. The show opening times are, Saturday: 10.00 to 17.00 and Sunday: 10.00 to 16.30. Also if you are not already a member of the excellent South Western Circle, the historical society for the London South Western Railway, then they will be present with a stand and you will be able to sign up at the weekend! USA 0-6-0T No. 68 shunts on the quayside at Canute Road Quay. She is a model rail commissioned loco by Bachmann. If you planning to pop along to either of these shows, please make sure you to say hello. In addition to appearing at these two shows a few more exhibition appearances are lined up as part of the Canute Road Quay tour along also with a couple more appearances planned for Fisherton Sarum, check out my exhibition diary page here for further information. 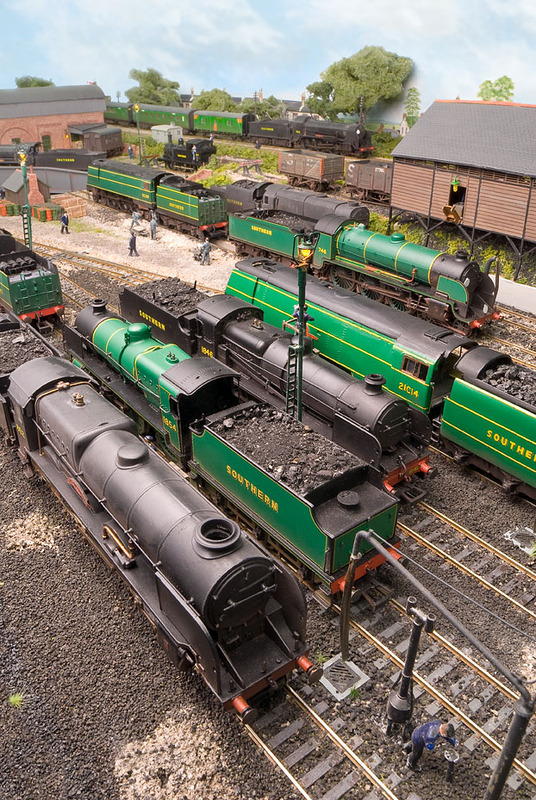 Regular readers of this blog will know that I do not exhibit Fisherton Sarum all that often, primarily so that it does not become too familiar on the exhibition circuit, potentially avoiding the walk on by syndrome that can be seen with some layouts that the public has seen time and time again. However I do enjoy heading out on the road a few times a year and meeting up with old friends and making new ones especially those made through my ramblings here on this blog, if you do manage to get along to any of the shows I am at please make sure you say hello. Other exhibitions appearances currently in discussion will be added to the list on my Exhibition Diary page here when confirmed. I am of course indebted to the continued valued help and assistance of my family and also members of the High Wycombe and District MRS, of which I am a member, to make exhibiting Fisherton Sarum possible at all.